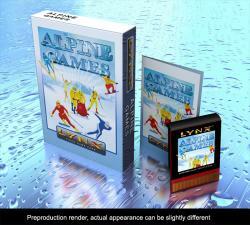 If you still not own Alpine Games but you like to get it, this is probably your last chance. Today we start a reservation list for a last final run of Alpine Games cartridges. For more information take a look here. Edited by Duranik, Mon Mar 9, 2015 10:58 AM. Wow the new box looks great! Very nice! I don't own this so have just sent an e-mail to put me on the reservation list. (Kinda go to really)! Wow, I got Alpine Games on its original release with orange plastic box and PCB. I love the look of this release though so put me on the reservation list please! Duranik, I don´t know if you did follow the new LCD replacement mod / VGA mod activities for the Lynx II, there is a kit made by McWill from Germany and of course with those newer faster displays the Hicolor pictures used in games like Alpine Games are flickering as you can see in my review video below at 8:15. I don´t know if it would be possible to fix that if the user could choose if he has a new LCD or an old one, by changing the "display frequency" or something. And maybe you don´t have time and resources to think about that, but just saying that would be a "historical chance" to have the first Hicolor game that also supports that excellent newer display type. But of course the game is still playable without such a fix I guess. Edited by vectrexroli, Mon Mar 9, 2015 1:58 PM. don´t have the time to do this at the moment. Awesome! Emailing you now. Looks like I'll have to get a Lynx one for my non-lcd upgrade gaming..
Wow! I love the look of that cart! I sent my reservation email, beautiful box by the way! Has this curved lip cart got two side lips too? That's a first! Extra stability in the lynx. Doesn't hurt to have an extra lynx for the odd time you'll want to Comlynx That's what I'm doing, have the LCD screen on the way and will get another Lynx for it, as I still want to keep the one I've had for ~15 years unmodded and it'll also be great to link a few Lynx's together. Edited by Willard, Mon Mar 9, 2015 4:20 PM. My order is sent as well. Awesome release by the looks of it. Figured now was as good as ever to join AA, I'll be sending an email through shortly! Heard some great things about this game, glad to see it is getting another run! Email sent! This is the best news all day! This has got to be the best looking Lynx cart ever - Love it! - E-mail sent. I'm in for one. Email sent! Might be wise to limit this to one per person. Already got a copy. But I still want one more just in case. This is the one game (in addition to Lemmings) that I find myself playing every now and then. The gameplay is not too complicated. The graphics is superb. THANK YOU VERY MUCH!! email sent! I missed out on the original run and am now glad that i did! This whole package looks FANTASTIC! Echo that! The back of the new Alpine Games cart looks MINDBLOWING! That really pisses me off! I wish there was an easy to track numbered system (or other) to see who just orders and re-lists so that they can be banned from further limited run sales! email sent. Sign me up!